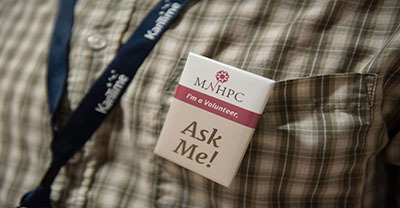 Interested in volunteering with MNHPC? We rely on volunteers to help us at events or with special projects throughout the year. If you are interested in finding out more about how to volunteer with MNHPC contact us at [email protected]. We also rely on volunteers to help make our annual conference so successful. Volunteers staff registration tables, serve as greeters and guides, act as room monitors for breakout sessions and perform a variety of other tasks. The volunteer application process for the annual conference starts in January.